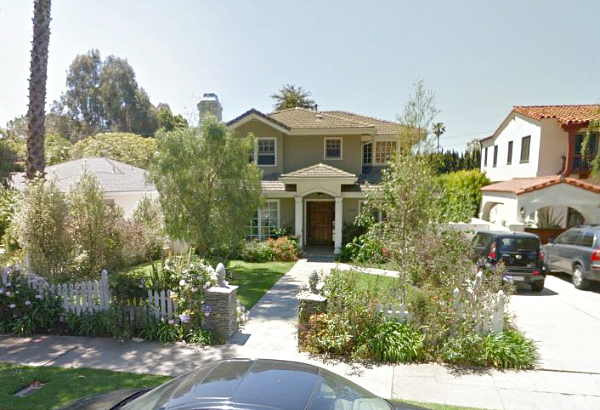 Phil and Claire Dunphy’s house on the popular sitcom Modern Family is for sale in L.A. The homeowner gets paid each time the show shoots exterior scenes on the property, but the interiors were recreated on a soundstage. 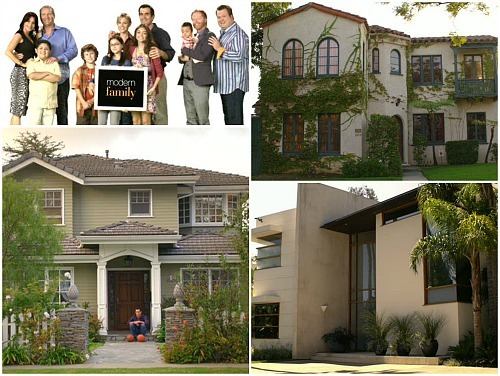 Let’s compare the real house to the one seen on TV, shall we? That’s the listing photo above for the house, which has 4 bedrooms, 5 baths, and nearly 2,700 square feet. Listing agent Mitch Hagerman of Coldwell Banker Previews International added that it would be up to the new owner whether or not to allow the show to continue filming here. Could be interesting if they have to find somewhere else to shoot. Like the TV version, the real house has a staircase that goes straight up from the front entry (above). Even though the decorating is different, the layout is essentially the same. Asking price is for $2.35 million. Want it? For more photos and information, check the Coldwell Banker listing, Realty Today, the Wall Street Journal, Redfin, and the LA Times. Would you like living in a house made famous on TV, or would you prefer something a little more “anonymous”? The Mary Tyler Moore Show house is on the market in Minneapolis right now, too! The Cabin from "On Golden Pond"
Tom Selleck’s House from “Her Alibi” For Sale: See How It Looks Today! I like both interior versions of this home, but I think the show has created something a bit more casual and comfortable. I wouldn’t enjoy the notoriety of living in this or any other “TV” home. I would be worried about the lack of privacy, especially where my children are concerned. The royalties associated with this might be nice, but I suspect that if you can afford a home like this in L.A., you don’t really need the cash! 🙂 I don’t see Restoration Hardware myself. To me, this looks more like a combination of Pottery Barn and Pier 1. I think it must be the “old” Restoration Hardware look before they revamped their stuff, huh? That’s all I could figure. Good call on the Pier One. They did use some things from there, including those bird plates in the kitchen! PS I’m a new follower of your site and I love it. Ooh, how fun! Thanks, Libbie! I love, love, love Modern Family + literally LOL during each episode. Phil might be my favorite character. Re: this house. Well, they had me at Restoration Hardware meets Pottery Barn. I love those 2 places just tad! I love Phil, too. I was re-watching a bunch of episodes while working on this post (trying to get screenshots) and he was cracking me up! For several years, the actor portraying Cam kept winning all the acting awards (Emmys, Golden Globes, etc.) . . . but lately, the Phil guy is being recognized. He is the voice of the dog in the new Peabody movie. Too bad I can’t (or am too lazy to) research the name of either of these guys! I didn’t know he was in the Peabody movie. Interesting! For a new home, the house has some good bones. I would not want it though despite the extra income it brings. I enjoy my privacy. It’s bad enough living in a historic neighborhood. My house was on the historic tour last year before we bought it and we still have people driving by very slowly and looking. Thanks for posting the pics. It is always fun to see the real interiors of movie/television shows. Modern Family is my favorite show – one of my favorites of all times, actually. I think if I bought that house I’d still let them use it since I’m a fan. I would change the decor a bit, though. More like the show, but with a bit more individual decor and more antiques. I’d really like Mitchell and Cam’s house if I could have the whole thing. I wonder if the real house is split into apartments like on the show? Thanks – I just looked at the link. I’d love to see the inside of that one. Am I the only one who always loves the TV house more than the real hues, including this one? I especially love this house and the Home Alone house better than the real house. I always feel the TV houses have a more neat and polished look, while still looking more cozy. It’s hard to beat the spaces created by professional set designers, that’s for sure! The show has taken external pics and recreated the house so what is the house needed for ? They cant edit in the cast for new photos? They sometimes shoot scenes outdoors on the property. I guess they’d just have to work around that somehow. I love it when you do these comparisons! SO much fun! I would get so sick of tourists stopping by. That was fun to compare the photos. That would get old for the neighbors to deal with lookiloos, let alone the traffic of a production crew. We actually live near where they film the exterior shots for Raising Hope, but it’s on a restricted access street. How fun! “Parenthood” is another show with great sets. Thx for sharing this ! I love, love the Dunphy house. What color paint do you think is in the living room(with piano ). I went crazy trying to track it down with no success. I realize it is just tan, but I really like it. Thx!! Wish I knew! Has anyone tried anything similar? The only paint colors I came across for these sets were for the blue in the entry and the green color in Mitch and Cam’s house. 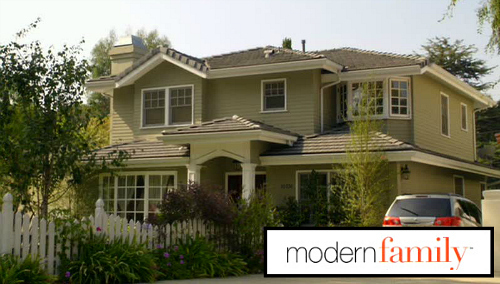 Modern Family is one of the few episode shows I record…very funny. Out of the three show house interiors I like Mitchell & Cam’s vintage-y house the most, especially the authentic looking tile kitchen and I think I saw it in their bathroom, too. But, no I wouldn’t want LookyLoos coming around my house if it was used for a show or film…I know the Brady Bunch house (somewhere out here) has a big following & that must be annoying..even 40 yrs later. Is that an inflated price that the owners are hoping to get because of the show? I guess I might sell too and set myself back a little something. “The Middle”. Then I watched a few episodes and thought Sofia Vergara’s character was a hoot! Then I watched the Wizard of Oz episode(remember that one?) and I laughed so hard I cried. That’s when I was hooked for sure. Yeah, I have a feeling it’s a bit inflated because it’s famous. And it’s a moneymaker for whoever buys it. P.S. “The Middle” is one of my favorite shows. I always look forward to seeing both it and “Modern Family” on Wednesday nights! Is there a name for those chairs in the kitchen? I’ve been looking for them online and cannot find them. Any ideas? I just adore your blog. You do such a fabulous job. I love the house on Bones that they bought. I say it everytime I see it. The back of this house surprised me. Thanks, Leigh! I was surprised by the back of the house, too. The back of the house looks bigger to me on the show, so I’m wondering if they shoot the backyard scenes somewhere else. Thank you for sharing the paint color for the entryway! My husband and I watch Modern Family, and he recently commented on the fact that he liked that paint color. He doesn’t usually do that, so I was very excited to find out what it was. That is a great shade of blue. I love it when Production Designers share their paint colors with us because they’re usually so hard to track down! I love Modern Family! My favorite house is the Wallace Neff design belonging to Mitch and Cam. We all know how TV houses really don’t hold up to the reality of what most people can afford. So, could the middle class Dunphys afford a $2.35 million house on one income? Is that realistic for a real estate agent there? I know southern California is like a different country as far as housing goes, but I wonder what sort of house the average income of a fairly successful real estate agent with three kids could really buy. I know, TV is not supposed to be reality! And yes, Phil totally cracks me up! My guess is that it would be a bit of a stretch for Phil, who never comes across as being hugely successful at real estate. Ha. The chess table is magnificent I wish I could see more of the detail and inlay.I would live to recreate a piece of furniture like that myself. Beautiful mouldings and floors. Anyone know the color of the the exterior paint? Love it and really wish to use it in the future. Thanks in advance! Wish I did! Not sure how you could find out short of asking the homeowner. You could probably find something similar without too much trouble, though!